Mary, a senior manager, is recently back from maternity leave. She’s juggling a demanding client-facing role with mothering her 15-month old little girl and is, unsurprisingly, battling exhaustion. Mary comes into our coaching conversation in a dilemma. She’s been asked to go through the interview process for director (which is quite long-winded in her organisation) and the deadline is coming up soon. It feels like too much at the moment, but she’s worried : What happens if she doesn’t go for it? Will that mean her career will stall? Won’t that impact her reputation? Yet on the other hand, how will she cope if she does go for it? What will that mean for her capacity to be a good mother to her little girl as well as holding down her job? As I listen to Mary, I hear an overwhelming amount of mental noise. I ask Mary to check if there’s any tension in her body. She notices that her neck and shoulders are very tense. She’s surprised to notice this, though when she does, she realises it’s a familiar feeling. I invite Mary to sit back in her chair with her feet on the ground and take a few deep breaths. She notices that some of the tension releases and there’s a sensation of sinking into her body and the chair. After a few moments, I ask her, “When you consider the dilemma you’re facing, what’s coming up for you now?” Without a second thought, Mary said, “Doing what makes me happy, not what makes other people happy.” For her, that means staying in her current role for another year and having conversations with her line manager about a career plan that works for her as well as the business. We’ve evolved to avoid danger and, even though we’re not faced with sabre-toothed tigers anymore, the modern-day environment poses us with lots of what Rick Hanson calls “paper tigers” for us to get worried about, whether that’s emails demanding a response, an angry client, the threat of redundancy…the list goes on. Given the constant amount of stimuli in our environment, it’s normal to be on a constant state of alert which can mean tensing up our stomach and shoulders, and breathing high in our chest. And breathing from our chest rather than our diaphragm can in turn elevate our heart rate, depress our mood and our immune system – and impair our ability to think. Watch this fascinating and informative 12 minute video from Dr Matthew J Taylor to understand more about this mind/body dynamic. No wonder Mary was struggling to get in touch with her inner counsel. Where is your breath right now? I invite you right now to take a breath in through your nose and imagine you’re pulling it down into your chest then your belly. Let your belly expand like a balloon. Then let your breath out through your mouth and allow yourself to deflate. It can take a few goes to get the hang of it. What does this exercise tell you about where you’ve been holding tension? What is different about how you are thinking and feeling now you’ve done this exercise? What perspective do you have now that you didn’t have access before? 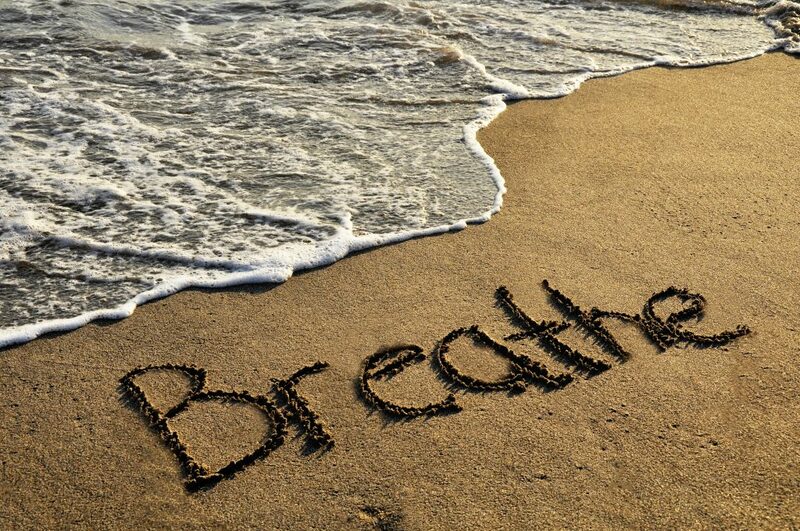 What would be different for you if you were to build a breathing practice into your day like Mary did? How could you make it easy to create a habit? For example, could you take 3 deep breaths every time you sit at your desk, or every time you go to the water cooler? I’d love to know how you get on. Do email me at alison@alisonreid.co.uk.